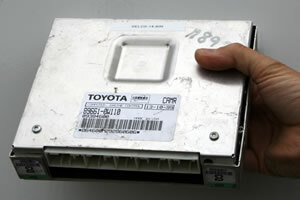 In 1998, Toyota began equipping some of their more popular vehicles with a transponder based imnmobilizer system. The applicable vehicles are listed below. (Registration Mode) so that it's ready to accept your provided keys. Whatever you prefer! and we will return it to you reset and ready to install. You choose the shipping option you desire, anything from ground to overnight service to suit your timetable. that must be recognized by the vehicle before it will start. The circuitry that controls this function an integral part of the onboard computer system of the vehicle. Until the system recognizes a pre registered key, the starting , fuel, and ignition systems of the vehicle are not functional. 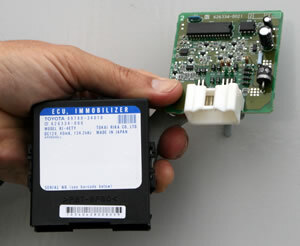 Unlike some add on security systems, bypassing this immobilizer is not a matter of removing a component or splicing some wires to hot wire the vehicle. This is good news for the vehicle in terms of theft prevention, but can quickly become a nightmare for the owner that misplaces the keys to the vehicle. for the vehicle. The mechanical cuts can be transferred to the new transponder key blank using a key duplicator just like it has been done for years. At this point, the new copy of the key will lock and unlock the doors, open the trunk, and even unlock the steering wheel and turn the interior accessories on, but it will not start the vehicle until its unique electronic code is recognized by the vehicle. This is accomplished by using one of the master keys already registered with the vehicle to initiate the programming mode. This can be done with any of the pre registered master keys, but cannot be done with a valet key. , many owners will tend to delay or forgo the expense. This can come back to haunt them in a big way! Previously when all keys to the vehicle were lost, the owner would bite the bullet and have a locksmith originate new keys for the car from scratch. This would cost considerably more than a duplicate key, and depending on the time of day (night) and location of the vehicle could cost anywhere from less than one hundred, to several hundred dollars. vehicle and have read this far, continue to the next paragraph for the best free advice you will get this week.